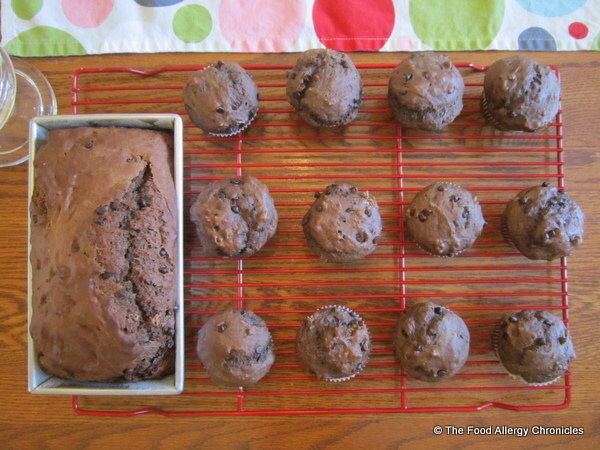 Posted on May 27, 2013 by Susan H.
In an attempt to bake an allergy friendly muffin that would appeal to my boys…I adapted a recipe I had clipped from my Chatelaine Magazine. 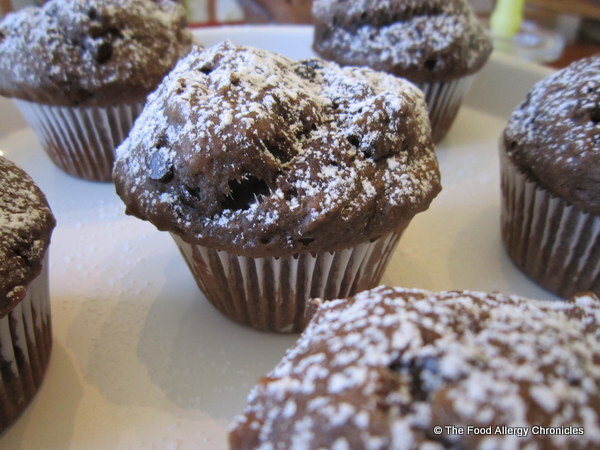 …these moist muffins are full of a double dose of chocolate with just a hint of banana. Basket in hand…I hit the streets in search of my boys and their friends for a taste test. I found Andy in the driveway organizing his fishing gear…he jumped at the chance for a muffin. A stroll down the road…I found the boys at their friend William’s house. 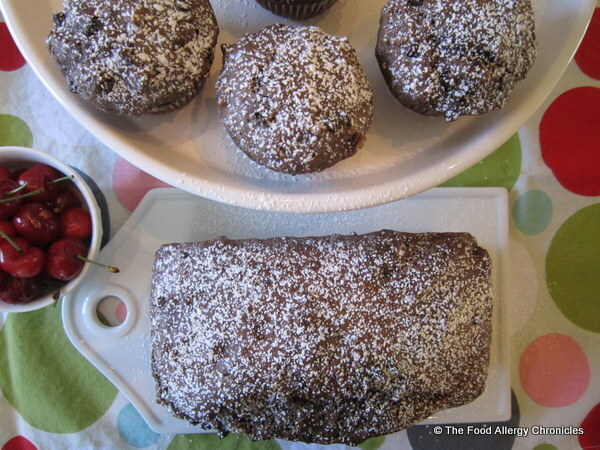 My appearance was a bit of a surprise…an impromptu ‘muffin tasting party’ ensued. Matthew, William and his mother, Linda, enjoyed the muffins…unfortunately, Michael was not so keen…he is just not into bananas lately. 2) I replaced the 2 eggs with 3 tbsp. water mixed with 3 tbsp. of canola oil. Add 2 tsp baking powder and mix just before adding it in when called for in the recipe. 3) I replaced the 2 cups of buttermilk with 2 cups Natur-a Rice Beverage or Natur-a Soy Beverage mixed with 2 tbsp. white vinegar and left to rest while I measured the rest of the ingredients. 4) I reduced the salt from 1 1/2 tsp to 1 tsp…it just seemed too much. A Dairy, Egg, Soy and Peanut/Tree Nut Free Double Chocolate Muffin was the perfect ‘treat’ to enjoy mid-afternoon with my coffee. What kinds of muffins do you enjoy? P.S. 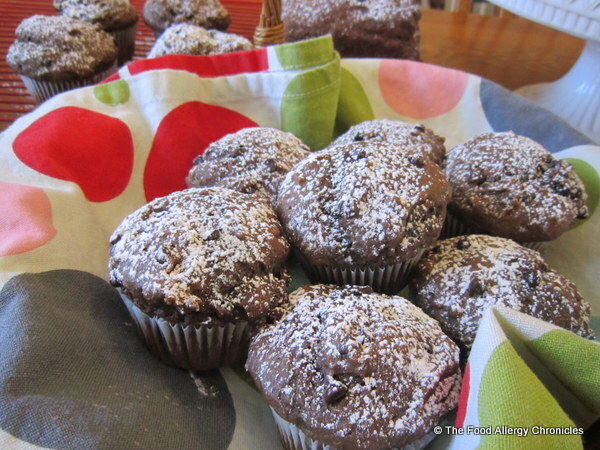 Sending Happy Birthday wishes to my brother today…I think he would enjoy these chocolate banana muffins. This entry was posted in allergies, baking, dairy free, egg free, muffins, multiple food allergies, peanut/tree nut free, Snacks, soy free and tagged Chatelaine Magazine, Dairy Egg Soy and Peanut/Tree Nut Free Double Chocolate Muffins and a loaf, Enjoy Life Mini Chips, Natur-a Rice Beverage, Natur-a Soy Beverage by Susan H.. Bookmark the permalink. Wow, I wish I could have one RIGHT now…These will be a huge hit here. We even have the Enjoy Life chips at our local (limited selection) store!